Those We Left Behind finally gets to see the original Wes Craven directed ‘The Hills Have Eyes’. Bemusement, amusement and disappointment ensue. Wes Craven directed this film. It was the follow up to ‘The Last House on the Left’. Let me tell you a little bit about ‘last house on the left’. It is one of the grimmest, brutal and definitive revenge movies. Having seen it over 15 years ago for the first time, it left me feeling a little corrupted and tainted for having watched it. Nearly 40 years later it retains its ability to shock and appall. ‘The Hills Have Eyes’, is ostensibly a reboot of the ‘last house on the left’ formula – i.e. ‘outsiders’ attacking the archetypal ‘normal’ family with the tables are turned and the hunter becoming the hunted in the final act of the movie. 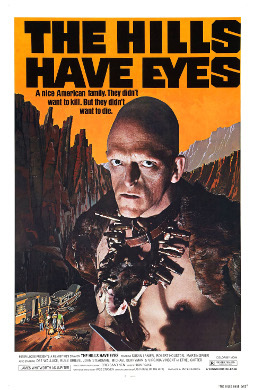 Released in 1977, and with the formidable Michael Berryman at the forefront of the films publicity poster art, ‘The Hills Have Eyes’ promises horror, replete with scares and brutality. The plot is essentially this – an extended All-American family (including a baby and the family pet Alsatian dogs ‘Beauty’ and ‘Beast’), on a road trip, become abandoned in the middle of a US Desert wilderness that also serves as a USAF bombing range. In the midst of this desperate situation, with supplies negligible and the sun and heat becoming a problem in the hostile surroundings, they come under attack from a desert dwelling Cannibal hunter clan, hungry for victims. After the gas station visit, the family head off and we get the inevitable vehicle incident that leads to the family being stranded in the desert. They should have stuck to main road!!! There is a certain amount of suspense in these scenes but it is largely funny, and I assume that to be unintentional. The mom and dad seem so inept, the dad especially – if he was a cop for so long in Cleveland, how come he completely freaks out when the occupants of the car start wailing because of low flying planes??? They had already been told (by Fred at the gas station) that it was a bombing range – so why would they be so surprised by a couple of low flying planes? You can give them the benefit of the doubt about being jumpy about one – but two??? The car loses control for what feels like an eternity, with dad at one point having his face covered in the map that mom is using to navigate those dusty plains, until (finally) a tiny rabbit in the path of the runaway car causes dad to go into evasive action – the end result being that he manages to break a wheel off the axel and everything comes to a shuddering halt…….oh, the calamity!!! It turns out that this desert path, off of the main road, that they were told not to stray from, was booby trapped AND REMEMBER – FRED HAD TOLD THEM TO STICK TO THE MAIN ROAD – WAAAAHHHHHHHHH!!! Dad goes to look for help and manages to get back to Fred. Then all is revealed – the desert where they are stranded is menaced by this cannibal clan. The cannibal clan is led by the patriarch, known as Papa Jupiter. Fred describes how he and his wife in the 1920s started a family and she gave birth to a baby girl. A few years later his wife fell pregnant again. This pregnany would bear the child who would become ‘Papa Jupiter’. In Freds testimony, (which is one of the highlights of the film) Jupiter is described as being born a monster, covered in hair, and of such huge proportions that he killed his mother in childbirth. As he grew into an unnaturally large child his murderous instincts surfaced, first by killing livestock and then eventually setting fire to his fathers farm, and in that event killing his sister, Freds daughter. Seeing his beloved girl burnt to a cinder, Fred took his revenge on his son by beating him with a tire iron and leaving him in the desert where he felt sure he would not survive more then a few hours. This proved untrue, and Jupiter eventually took up with a depraved whore known as Mama. Together they had four children, three sons and one girl. As a family, they terrorized this stretch of desert, killing, stealing and cannibalizing. Soon after this revelation, Fred dies at the hands of his son in one of the better scare moments of the film. Basically from then on its all about the family in peril – a curious incident involving one of the dogs in the rocky outcrops leads to further danger to the family, with dad ending up toasted, baby snatched and heading for the cannibal gangs cooking pot and several of the family murdered – but the fact is, I didn’t really care. The cannibal gang really lost their fear factor when the action moved from night time to bright sunshine. In the dark shadows they had carried a threat and almost supernatural menace, and their grotesque appearance had real potency in the shadows. In the bright desert sun, they looked like they were auditioning for an Italian post apocalypse movie, and anyway, why would the dad of the cannibal gang be running around with so much fur all over him in the midst of a blazing hot day? How had that guy managed to survive for so long out there?? Also, I have a big problem with having to try and ‘relate’ to the ‘victims’. This is how unsympathetic the ‘normal’ family are – when the baby is snatched, the father weakly pleads with the cannibal kidnappers in a whiny, reedy voice – kind of like ‘whyyyyy are you doing this?? ?’ Damn it man – go after them!!! Luckily, the baby has an advocate and protector – remember the cannibal clans daughter – Ruby – who wanted out early on in the film? Well, she turns out to be good after all, and in the climax of the film it is she who pretty much protects the baby from the murderous intent of one of the sons of the cannibal clan (all named after planets – Jupiter, Mercury and Pluto). I forgot to tell you about the male dog, Beast. Turns out he is a hero, one of the more engaging characters in the film and manages to dispatch more of the cannibal clan as an individual than any of the others. What does that tell you about the rest of the family? The film ends with the babyfather going all savage and killing the last remaining cannibal killer, ‘Mars’. Ooh look! Dramatic irony! The apparently ‘civilised’ one (aka babyfather) has been turned ‘savage’ by the unbearable burden of events visited upon him! Now he is the aggressor and ‘Mars’ is the victim!! What a shocking, sombre and thought provoking twist of events! One of the taglines for this film was ‘the lucky ones died first‘ –well, yes they were if they managed to avoid sitting through this. By the way – didn’t Michael Berryman go on to do a film called ‘Deadly Blessing’? I remember that from various video shops in the 1980s. I believe that was another Wes Craven film, probably before he hit on the ‘Nightmare on Elm Street’ franchise. In another time and place he could have become as iconic a horror figure as the likes of Lon Chaney and Bela Lugosi. In this sort of film his potential is never really released. Wes Craven made a sequel to this (part II) but it was derided as a poor film, and manages to bring back some of the cast from the first film, including the dog, ‘Beast’. I will not be rushing to see it. Considering it was a film I had often thought about watching, when I actually got to see it ‘The Hills Have Eyes’ was a bit of a disappointment – for all those reasons I listed previously. Alexandre Aja did a remake in 2006 – I heard its not too bad, so maybe it is worth a look. It has to be better than the original! There was then a follow-up to this remake of the original – ‘The Hills Have Eyes 2’, directed by Martin Weisz…..and co-written by Wes Craven. This was not, however, a remake of the original sequel, but garnered similarly negative reviews.